These classes are high paced and very technical. To participate you are required to know the 10P warm up curriculum as we do them on a timer with little to no instruction. After the warm up of the day we usually dive into technical drilling, and/or positional sparring. Classes end with free rolling. At 10P Bergen we don't put any restrictions on submission holds - all subs are legal! No prior experience needed, perfect for beginners. Slow paced, fun and technical, Mastering The Warm ups is your entry level into the 10th Planet universe. In this class we focus on the 10th Planet warm up curriculum, 8 sets of technical warm ups which need to be mastered. These 8 sets have 4 different flows in each, and focus on different themes in the nogi game. We also do some mobility and movement work, preparing you for the advanced class. At MTW we only do a little positional sparring at the end of each session. This class is more MMA oriented but the main focus is learning to apply your Jiu Jitsu in a full contact, free-fight setting. A lot of things change once striking is introduced, and we believe there's valuable lessons to be learned here. Striking keeps the game honest! These sessions are usually cardio heavy. Padwork, kicking/ punching, takedowns, grappling with strikes, all designed to pressure test your clinch game. Class end with free sparring: Shootboxing, Combat Jiu Jitsu or full Shooto. Just free play, little to no instruction. Rolling, sparring, drilling, whatever you want. During our Yoga sessions I will guide you through asanas, physical postures and breath synchronised movements in creative flows of both passive and dynamic character. I will use mixed methods from Iyengar, Ashtanga and Viniyoga. I have been on the mat training Jiu-Jitsu and Yoga since 2013. I certified as a Yoga Instructor from Yoga Works RYS200 in 2017. I have a genuine interest in health and well being, and have found training the combination Yoga and Jiu-Jitsu, or any other type of combat sports, to be the best combination of developing a healthy mind, body and spirit. Yoga and Jiu-jitsu complements each other as both philosophies focus both on technique over strength, flexibility, balance, alignment, breath control as well as physical and mental endurance. In both disciplines there is also an important awareness of the mind. In Jiu-Jitsu, or any other combat sport, you are facing an opponent, in order to that you first need to overcome the obstacles in your own mind. Through Yoga practice you become more aware of the connection of mind, body and spirit. I believe Yoga is the best suplement training you can do to become a better Jiu-Jitsu fighter and lower the risk of injuries, as it will help you correct imbalances, improve flexibility, increase strength and balance, body awareness and breath control. "We'll teach you how to BStrong, safely, and without interfering with your duty, job, or sport"
Tomasz is a very dedicated, and extremely competent coach. If you want to become sportspesific strong + develop general overall strength, then get with his program as soon as possible. Every one of us at 10p Bergen that trains with him has made drastic gains in strength, mobility and fitness level in a relatively short amount of time. He’s also very knowledgeable with regards to recovery from injuries and corrections of physical deficiencies. Highly recommended addition to your Nogi Jiu Jitsu training! 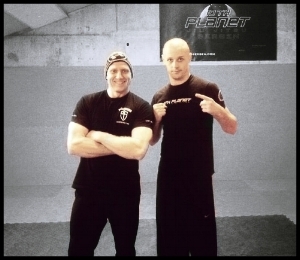 10th Planet Bergen is the first official 10th Planet Jiu Jitsu affiliate in Norway. The gym is located in Nordneshallen near Bergen city centre. We offer advanced 10th Planet Jiu Jitsu sessions Monday, Tuesday, Wednesday and Thursday, as well as Shootboxing and Combat Jiu Jitsu on Fridays, Yoga and Open Mat on Saturdays. We also offer pure beginner classes, highly structured, technical, safe and slow paced. Beginner class is called Mastering The Warmups and run every Monday, Tuesday, Wednesday and Thursday before advanced class. *You are welcome to drop by anytime for a friendly chat and/or free trial sessions in a serious, but chilled atmosphere among great people! Head Instructor: Frode Nilsen is a 10th Planet brown belt and certified moonhead under Eddie Bravo. Pro MMA fighter, a longtime 10p ronin and student of an array of different grappling arts. He started studying the rubberguard and lockdown-game during shootfighting sessions back in 2006 and was immediately hooked on the unorthodox and creative style of 10p. He has obtained the degree of 1.dan blackbelt in nogi Hokuseishinryu jujutsu and 1.dan blackbelt in Prokick-kickboxing and became the Norwegian champion in Sanshou 2009. Frode also started out with Greco Roman as a kid and has over 15 years of experience from different martial arts. He is also the man behind The Frodoplata-sub which in part led to the development of the Gogoclinch in the 10th Planet system. Frode is known to be a highly technical instructor with great attention to detail, and he will guide you thoroughly through each session, whether you are a beginner or an experienced practitioner.